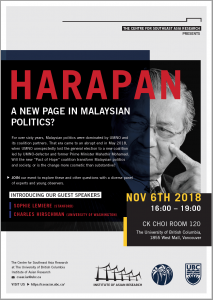 Home / Events / Harapan: A New Page in Malaysian Politics? 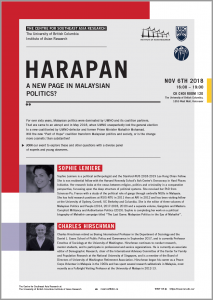 Harapan: A New Page in Malaysian Politics? This event finished on 06 November 2018. For over sixty years, Malaysian politics were dominated by UMNO and its coalition partners. That era came to an abrupt end in May 2018, when UMNO unexpectedly lost Malaysia’s 14th General Election to a new coalition led by UMNO-defector and former Prime Minister Mahathir Mohamad. Will the new “Pact of Hope” coalition transform Malaysian politics and society, or is the change more cosmetic than substantive? Join us to explore these and other questions with a diverse panel of experts and young observers. Our evening together begins with a presentation by Sophie Lemiere. Sophie is a political anthropologist and the 2018-2019 Lee Kong Chian NUS-Stanford visiting fellow. She is also a non-residential fellow with the Harvard Kennedy School’s Ash Center’s Democracy in Hard Places Initiative. Sophie is working on a political biography of Mahathir campaign titled “The Last Game: Malaysian Politics in the Eye of Mahathir”. After the presentation, we will engage in a roundtable discussion on the next steps for Malaysia, in light of the changes and continuities in Malaysian Politics. The roundtable will feature scholars and practitioners involved in the region. We are excited to share that Charlie Hirschman (University of Washington), a regional specialist on Southeast Asia, will join the roundtable.